Customers are your most valuable asset. So the ability to easily store, access and update their information is key. Sabre® Profiles changes the way you interact with customer data. With our robust profile capabilities, you can manage customer data better than ever before and create the best experiences for your travelers. KEEP PROFILE INFORMATION CONSISTENT throughout the agency by creating templates and assigning agent user roles in the system. SERVE TRAVELERS FASTER by storing and accessing preferences in profile types: Agency, Corporate, Traveler, Group and Operational. CREATE ASSOCIATIONS between colleagues, groups or family profiles, allowing all applicable trip data to be moved into a reservation in a single transaction. INCREASE PRODUCTIVITY by processing customer requests more quickly with expanded search capabilities and by using graphical menus that allow all needed information to be seen at a glance. KEEP DATA SECURE by storing profile and credit card information in a relational database that is PCI compliant. BE ONE STEP AHEAD OF TRAVELERS when they are making arrangements. Know their hotel preference, type of rental car needed, and even the different airlines they like to fly when traveling for work versus leisure. 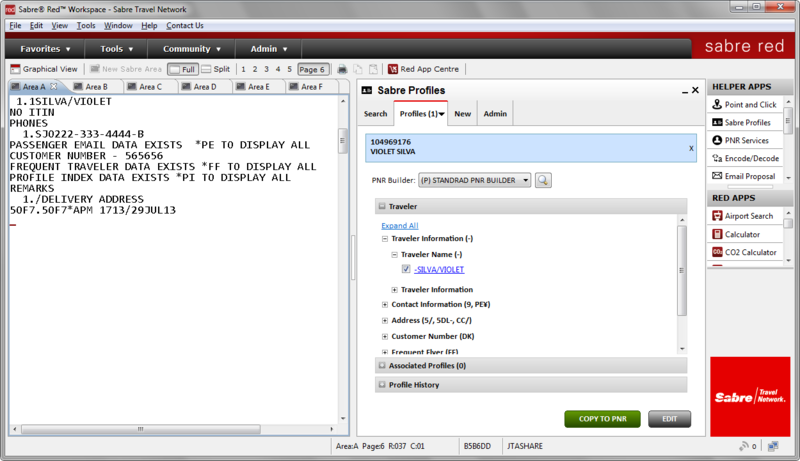 KEEP YOUR DATA CONNECTED and serve up accurate, well-rounded information when using Sabre Profiles. Amaze them with special offers based on their trip type and preferences. Be the hero. EQUIP YOURSELF FOR BETTER CUSTOMER SERVICE with the ability to choose what is to be captured in a traveler's profile. More than 1,600 unique data elements are available to capture in the profile database, such as air preferences, contact information and loyalty numbers. WORK MORE EFFICIENTLY with a user-friendly, graphical interface. Save time using templates, PNR Builders, associated profiles and priority notes. And search for customer information by using first or last name, phone number or email address. OPTIMIZE WORKFLOW AND REDUCE TIME spent on each booking by instantly accessing complete lists of profiles linked to a PNR. That means detailed information for each traveler or company can be right at your fingertips - and can be copied to the reservation in a single click. 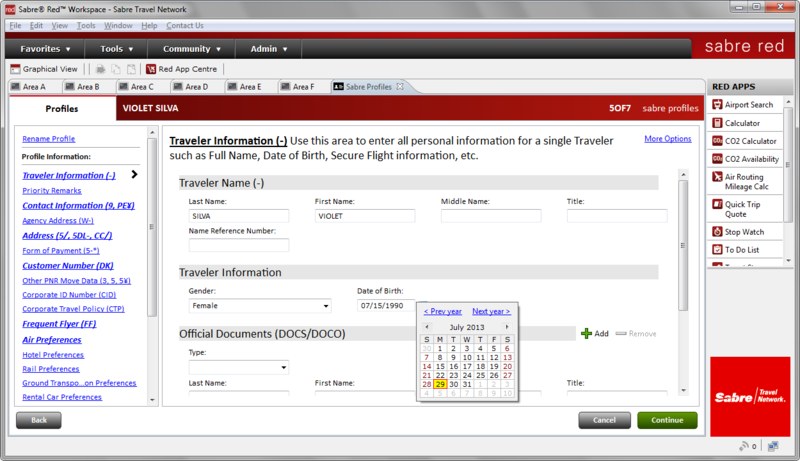 Simply add your traveler's profile information to the PNR with one simple click.